Tricalcium phosphate, Calcium silicate, Biocompatibility, Biodegradability, Osteoporotic compressive fractures. Osteoporotic Vertebral Compression Fractures (OVCFs) are the most common complications of osteoporosis [1-4]. Currently, minimally invasive vertebroplasty and balloon angioplasty are two main surgical treatments for OVCFs [5,6]. At present, Polymethylmethacrylate (PMMA) is the vertebral body forming material that have been most used in the world [7-10]. However, PMMA has many defects, for example, it cannot be absorbed in vivo, and present in the form of foreign matter in a long-term period to result in stress concentration between adjacent segments, and increase the risk of fractures of the adjacent spinal segments. It is simply a mechanicalsupporting material without functions of bone conduction and induction, which hinders the healing of spinal fractures. Therefore, it is very important to develop an absorbable biomaterial that can accelerate bone forming for the clinical treatment of OVCFs. Porous tricalcium phosphate TCP (Ca3(PO4)2) has been used in vertebroplasty, it possesses good biodegradability, biocompatibility and biological safety [1-8,11,12]. TCP has been investigated by scientists and engineers as a potential bone tissue engineering scaffold material [9-13]. However, it has not been widely applied clinically due to some shortcomings, such as rapid solidification, poor degradation and inconvenient operation [10,11,13]. CaSiO3 (CS) has a good ability to induce the deposition of hydroxyapatite, acceptable biocompatibility and bone binding and repair properties [14-17]. Recently, CS ceramics have been studied as bioceramics for new bone regeneration [18-20]. In this study, CS and TCP bone cement was prepared to improve the injectable properties and the biological activity of TCP cement and further provide a new strengthening biomaterial for OVCFs treatment. Calcium hydroxide suspension was added drop wise into phosphoric acid solution under stirring at room temperature, the mixture was reacted for 4-5 h followed by filtering and drying at 80°C to prepare TCP powder. Porous TCP material was prepared from stearic acid particle filling. The spherical particles of stearic acid with high purity were divided into different mesh with sample sieve, the particles with appropriate particle size and TCP powder were mixed, Polyvinyl Alcohol (PVA) solution was added as a binder. After molding, stearic acid was molten at 80°C then dried to obtain the porous mould. The mould was placed in a sintering furnace, and heated to remove residual moisture, PVA, stearic acid and other residues. The prepared TCP ceramics were ground and mixed with CS powder according to different ratios. The powder mixtures were calcined at 800°C for 2-3 h to produce TCP/CS nanocomposite powder. Polyethylene Oxide (PEO) was used as pore forming agent, TCP/CS powder and PEO particles were homogeneously mixed according to a mass ratio of 4:6, PVA solution was added as the binder to obtain biscuits. The biscuits were sintered at 800°C to give porous TCP/CS composites. The experimental grouping information is listed in Table 1. Table 1: Experimental groups of TCP/CS composites. The solidification time was determined by cement standard consistency setting time measuring instrument (Tianjin Qingda Instrument Equipment Co. Ltd.) according to a standard testing method. Six values were obtained with each group and the average value was calculated. After mixing the solid and liquid phases of materials with different time, the mixtures were loaded into a disposable syringe needle and gradually extruded from the needle. The injectability was determined by the weight of replacing materials before and after extrusion. The fluidity (%) equals material weight before injection divided by weight of material before injection. Six values were obtained with each group and the average value was calculated. A standard material sample is prepared by grinding. After curing for different time, the sample was loaded and pressed by a universal mechanical testing machine with a loading speed of 2 mm/min. The maximum fracture load (Fmax) was recorded. The compressive strength is calculated by Fmax divided by the cross-sectional area of sample to evaluate its mechanical strength. Again, each group was measured 6 times, and the average value was calculated. The adhesion and proliferation of rat Osteoblasts (OB) on the surface of material were detected by MTT. The OBs were seeded on sterile materials from each group in a 24-well plate, cell culture medium (1 ml) was added and cultured for 3 h at 35°C and saturated humidity conditions. After 12 h MTT solution (100 μL) was added in each hole and cultured for another 3 h. The culture medium was discard and the sample material was taken and placed in a new 24-well cell culture plate, DMSO (600 μL) was added dropwise in each hole and shaked for 20 min, three solution samples (200 μL for each) were transferred into 2 48-well culture plate, pure DMSO was added in the blank well for zero adjustment. OD value was measured at a wavelength of 490 nm using ELISA detection method. The inoculation and culture methods of OB proliferation experiment are same as above, OD value was measured at 490 nm using ELISA after culture for 1, 5 and 10 d, respectively. Six values were obtained with each group and the average value was calculated. The bone marrow cells were inoculated on the surface of materials in a 24-well cell culture plate to culture for 5 and 10 d. The culture medium was transferred and washed 3 times. OBs were obtained by cleaving with 1% Triton-X100 solution and incubated for 24 h at 10°C. The activity of the enzyme in the pyrolysis product was determined by ALP kit, and the absorbance of the solution was measured at a wavelength of 405 nm. The total protein content of each cell was determined by BCA method. ALP activity was expressed using a standardized value for total protein. Tongfang DA software (Version 2A.13B, Qinghua Tongfang Inc., China) was used for data processing. The experimental results were expressed by mean ± SD. Single-factor Analysis of Variance (ANOVA) was used to compare the difference between the control group and the experimental group, p<0.05 indicates that there are no significant differences between the data. The solidification times of materials in Groups A-C and control group are listed in Table 2. The solidification time of the sample material increases with the increase of CS content. Table 2: The solidification times measured from experimental groups. The fluidity of materials in each material did not show significant difference upon mixing, they all possessed good injectability. After 10 min, the materials in Groups A-C can still maintain good fluidity, the injectability was obviously better than control group (P<0.05). After 20 min, the difference in injectability of each group further increased. The injectability of Group A which contains 30% CS reached 90%, comparing the value of 58% for the control group. After 30 min, the injection ability of all groups decreased to different extents, the control group decreased most, and the injectability was only 33% (Figure 1). 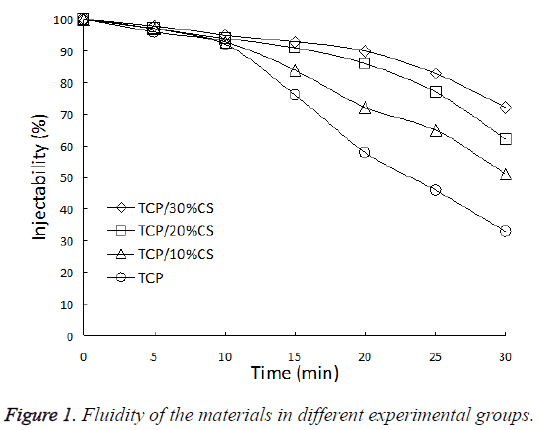 Figure 1: Fluidity of the materials in different experimental groups. Table 3 lists the compressive strengths obtained from material samples in experimental groups. The compressive strength for each group increases with the increase of solidification time. At the same time point, the material containing 20% CS has the highest mechanical strength (76 MPa), significantly higher than the control group (32 MPa and 41 MPa at the 1st d and the 5th d, respectively) (P<0.05). Table 3: Comparison of compressive strengths obtained from different groups. The results of MTT experiments showed that there was no significant difference between TCP control group and experimental groups after culturing for 5 h (P>0.05). After culturing for 10 h, the absorbance values (OD) of experimental groups were higher than TCP group with statistical difference (P<0.05), group C gave a highest value at 10 h (Figure 2). Figure 2: Comparison of adhesion ability on surface of different materials. As an increase in inoculation time, the cells exhibited a continuous increase on the surface of different materials. Figure 3 is proliferation curves of the cells. After culturing for 5 and 10 d, the OD value of all experimental groups were higher than the TCP group and the difference was statistically significant (P<0.05), suggesting that the materials in experimental groups are more conducive to the growth and proliferation of cells and they don’t have cell toxicity comparing the TCP group. Figure 3: Comparison of cell proliferation on surface of different materials. As an increase of time, the ALP activity of cells in all groups gradually increased, the ALP activity detection data of cells and materials after culturing for 5 d and 10 d were listed in Table 4. The results showed that ALP activity of experimental groups was higher than that TCP group, the difference was statistically significant (P<0.05). Table 4: Comparison of ALP activity in cells on materials surface. At present, most of the vertebral filling materials for OVCFs treatment are Polymethylmethacrylate (PMMA). However, PMMA has many significant defects, such as simple mechanical support, no bone conduction and bone induction, cannot be absorbed and replaced by self-tissues; high elastic modulus, and even PMMA bone cement block loosening and displacement. Therefore, a new type of vertebroplasty replacement material is urgently needed to provide sufficient mechanical support for the osteoporotic vertebral body and promotes healing of bone fracture by bone conduction and bone induction. TCP cement has been well developed thanks to its advantages, such as development, coagulation without releasing heat, and no cytotoxicity. TCP has been applied for vertebroplasty [6-12]. However, due to its brittleness, poor mechanical strength, curing difficulty after encountering body fluids and blood, this cement is difficult to meet the immediate stability requirements of elderly osteoporotic spine fracture after operation. Therefore it has been commonly used for young patients with type A vertebral fracture. The use of PMMA bone cement filling to compression fracture of vertebral body is actually for the purpose of relieving pain from mechanical stability via bonding the tiny fracture block inside vertebral body [15,17,18]. However, this process also directly affects fracture healing. 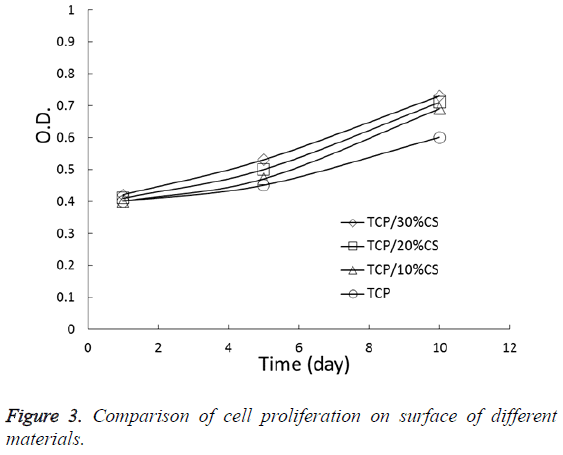 The results in this study showed that after co-culturing of cells with new alternative materials, alternative materials group was significantly higher than that of TCP group, suggesting that the introduction of CS materials helps to improve cell adhesion effect. The possible reason is that the SiO2 layer can be formed on the surface of the materials when it contacts with body fluid. It can produce high negative charge and promote cell adhesion to the material by adsorbing serum proteins. The SEM pictures showed that OBs can maintain normal cell morphology in the surface of TCP and the materials and adhere and grow through the protrusions in the material surface, suggesting that TCP and substitute materials are both suitable for cell growth, the good biological activity of new material can be confirmed. After co-culturing the cells and testing materials for 5 and 10 d, ALP activity of experimental groups were higher than TPC group. ALP activity increased gradually with time, suggesting that addition of CS into TPC can improve the cell differentiation and biological activity better than TPC. In this study, the ions dissolved and percipitated on the surface of materials can also provide a Ca2+ and Si2+ rich microenvironment for cells, which is beneficial to the growth, proliferation and differentiation of cells. However, it has been reported that ALP activity in human bone marrow stromal cells is not significantly increased through bioglass . But the in vivo biological glass is able to greatly promote bone regeneration, the possible reason could be contributed to the complicated microenvironment in human body containing various bone cells and growth factors. Therefore, in vivo bone regeneration promoting mechanism is more complicated, which is not only achieved by promoting cell differentiation of bone marrow stromal stem. Recent study also showed that a replacement material can effectively promote the differentiation of stromal cells of human bone marrow . Therefore, there are still some differences about the promoting effect of CS on human bone marrow stromal stem cells. Future studies are needed to investigate the biological responses of alternative materials to stromal cells of human bone marrow. A novel TCP/CS composite biomaterial with injectability was synthesized and developed in current study. This material possesses high strength and good biocompatibility, it might become a new biomaterial for vertebroplasy in the treatment of osteoporotic compressive fractures. Wiltfang J, Schlegel KA, Schultzemosgau S, Nkenke E, Zimmermann R, Kessler P. Sinus floor augmentation with beta-tricalciumphosphate (beta-tcp): does platelet-rich plasma promote its osseous integration and degradation? Clin Oral Implants Res 2010; 14: 213-218. Yuan J, Cui L, Zhang WJ, Liu W, Cao Y. Repair of canine mandibular bone defects with bone marrow stromal cells and porous-tricalcium phosphate. Biomaterials 2007; 28: 1005. Bucholz RW, Carlton A, Holmes RE. Hydroxyapatite and tricalcium phosphate bone graft substitutes. Orthop Clin North Am 1987; 18: 323-334. Mirtchi AA, Lemaitre J, Munting E. Calcium phosphate cements: action of setting regulators on the properties of the beta-tricalcium phosphate-monocalcium phosphate cements. Biomaterials 1989; 10: 475-480. Kotani S, Fujita Y, Kitsugi T, Nakamura T, Yamamuro T, Ohtsuki C. Bone bonding mechanism of ß-tricalcium phosphate. J Biomed Mater Res 1991; 25: 1303-1315. Takahashi Y, Yamamoto M, Tabata Y. Osteogenic differentiation of mesenchymal stem cells in biodegradable sponges composed of gelatin and beta-tricalcium phosphate. Biomaterials 2005; 26: 3587-3596. Shavandi A, Bekhit EDA, Ali A, Sun Z, Ratnayake JT. Microwave-assisted synthesis of high purity β-tricalcium phosphate crystalline powder from the waste of green mussel shells ( perna canaliculus ). Powder Technol 2015; 273: 33-39. Yin Y, Ye F, Cui J, Zhang F, Li X, Yao K. Preparation and characterization of macroporous chitosan-gelatin/beta-tricalcium phosphate composite scaffolds for bone tissue engineering. J Biomed Mater Res 2003; 67: 844. Peter SJ, Miller ST, Zhu G, Yasko AW, Mikos AG. In vivo degradation of a poly(propylene fumarate)/beta-tricalcium phosphate injectable composite scaffold. J Biomed Mater Res 1998; 41: 1-7. Kurashina K, Kurita H, Hirano M, Kotani A, Klein CP, De GK. In vivo study of calcium phosphate cements: implantation of an alpha-tricalcium phosphate/dicalcium phosphate dibasic/tetracalcium phosphate monoxide cement paste. Biomaterials 1997; 18: 539. Yashima M, Sakai A, Kamiyama T, Hoshikawa A. Crystal structure analysis of b-tricalcium phosphate ca3(po4)2 by neutron powder diffraction. J Solid State Chem 2016; 175: 272-277. Szabo G, Suba Z, Hrabak K, Barabas J, Nemeth Z. Autogenous bone versus beta-tricalcium phosphate graft alone for bilateral sinus elevations (2- and 3-dimensional computed tomographic, histologic, and histomorphometric evaluations): preliminary results. Int J Oral Maxillofac Implants 2016; 16: 681-692. Torres PMC, Gouveia S, Olhero S, Kaushal A, Ferreira JMF. Injectability of calcium phosphate pastes: effects of particle size and state of aggregation of β-tricalcium phosphate powders. Acta Biomaterialia 2015; 21: 204-216. Tarafder S, Dernell WS, Bandyopadhyay A, Bose S. Sro- and mgo-doped microwave sintered 3d printed tricalcium phosphate scaffolds: mechanical properties and in vivo osteogenesis in a rabbit model. J Biomed Mater Res Appl Biomater 2015; 103: 679. Ono M, Sonoyama W, Yamamoto K, Oida Y, Akiyama K, Shinkawa S. Efficient bone formation in a swine socket lift model using Escherichia coli-derived recombinant human bone morphogenetic protein-2 adsorbed in β-tricalcium phosphate. Cells Tissues Organs 2015; 199: 249-255. Correa D, Almirall A, Carrodeguas RG, dos Santos LA, De Aza AH, Parra J. A-tricalcium phosphate cements modified with β-dicalcium silicate and tricalcium aluminate: physicochemical characterization, in vitro bioactivity and cytotoxicity. J Biomed Mater Res Appl Biomater 2015; 103: 72-83. Wu C, Xia L, Han P, Xu M, Fang B, Wang J. Graphene-oxide-modified β-tricalcium phosphate bioceramics stimulate in vitro and in vivo osteogenesis. Carbon 2015; 93: 116-129. Xie L, Yu H, Deng Y, Yang W, Liao L, Long Q. Preparation, characterization and in vitro dissolution behavior of porous biphasic a/β-tricalcium phosphate bioceramics. Mater Sci Eng 2016; 59: 1007-1015. Matsuura T, Akizuki T, Hoshi S, Ikawa T, Kinoshita A, Sunaga M. Effect of a tunnel-structured ß-tricalcium phosphate graft material on periodontal regeneration: a pilot study in a canine one-wall intrabony defect model. J Periodont Res 2015; 50: 347-355. Matraszek A, Szczygiel I. Phase relationships in the tricalcium phosphate-cerium phosphate system. Thermal behavior of phases present in the system. J Am Ceramic Soc 2015; 95: 3651-3656.